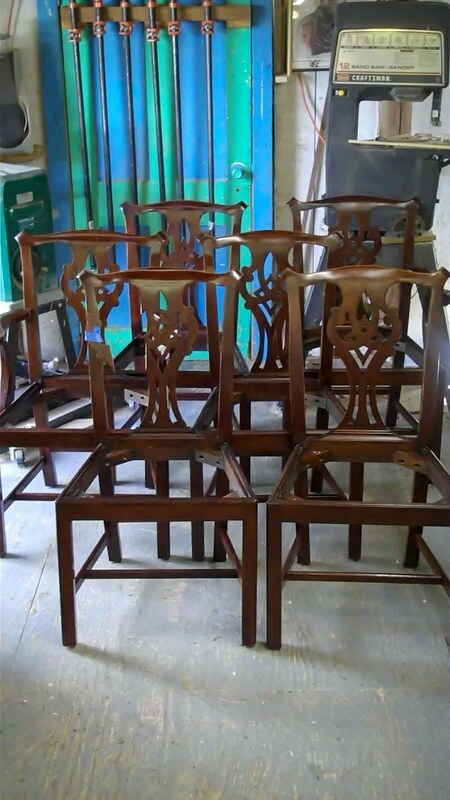 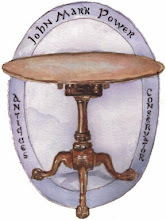 all of the chairs and bases are made exclusively of Honduran Mahogany. 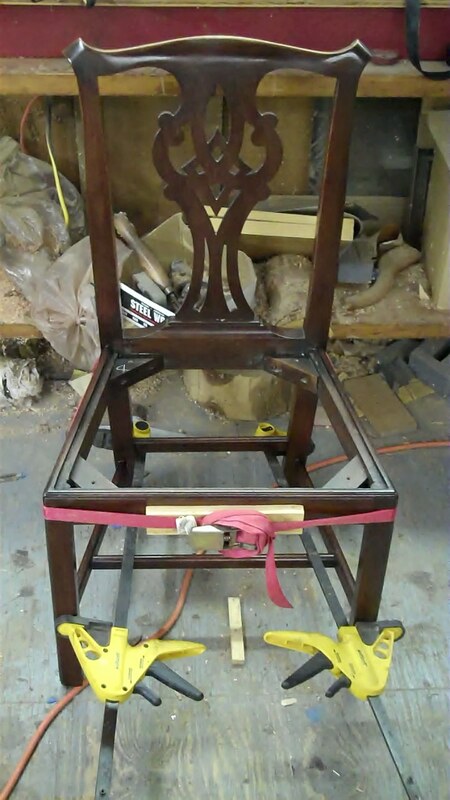 The bases had some structural repairs that were needed and the chairs needed to be re-glued. 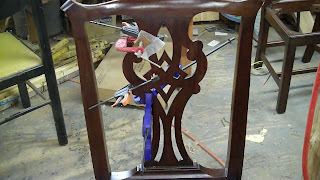 In addition, The whole set needed some touching up and cleaning. below are some photos of the repair work being done. 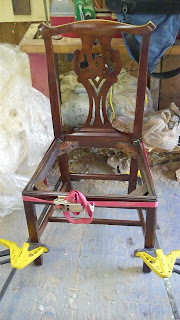 I will post some more photos as the job progresses. 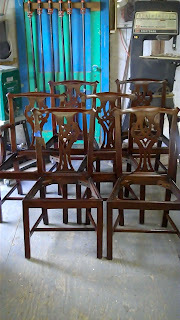 Here is a photo of the dining chairs and the table bases as they arrived in my shop. 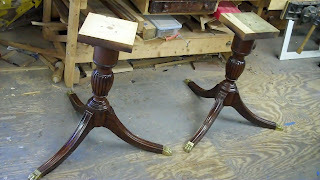 This leg design is always problematic and over time the legs either crack or loosen from the pedestals. This set was no exception. Below are some photos of the repairs made to the bases. One base with the legs removed, the blue tape indicates which leg goes where. 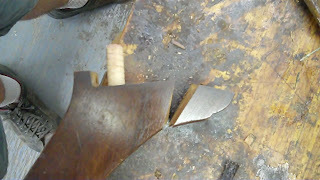 The pedestals had cracked where the legs met due to dowels put into the end grain through the legs. 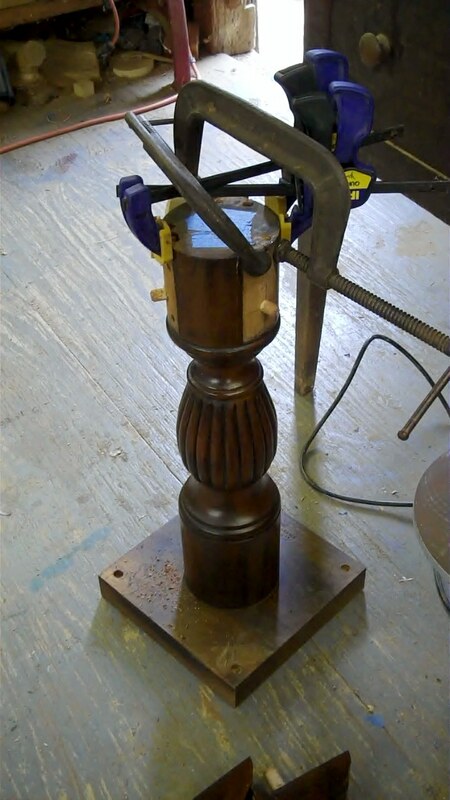 this was supposed to strengthen the joinery, but instead caused the bottoms of the pedestals to splinter. 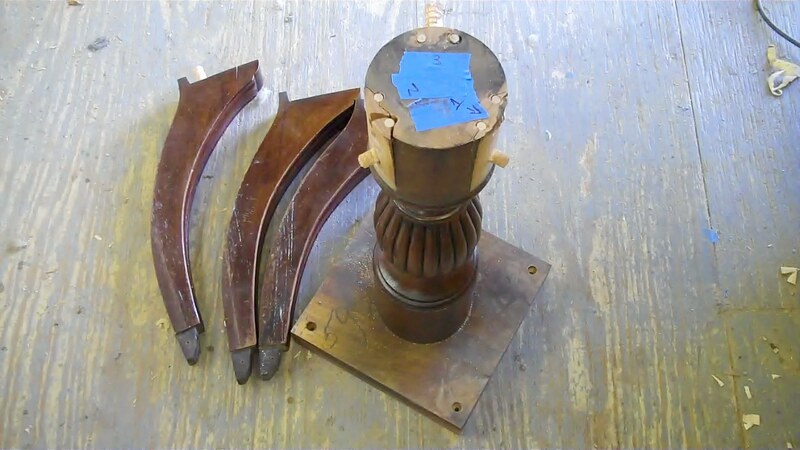 This photo shows the repair to the pedestals. 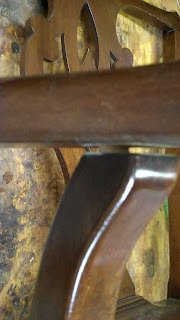 One leg had developed a crack where the upper dowel entered the leg. 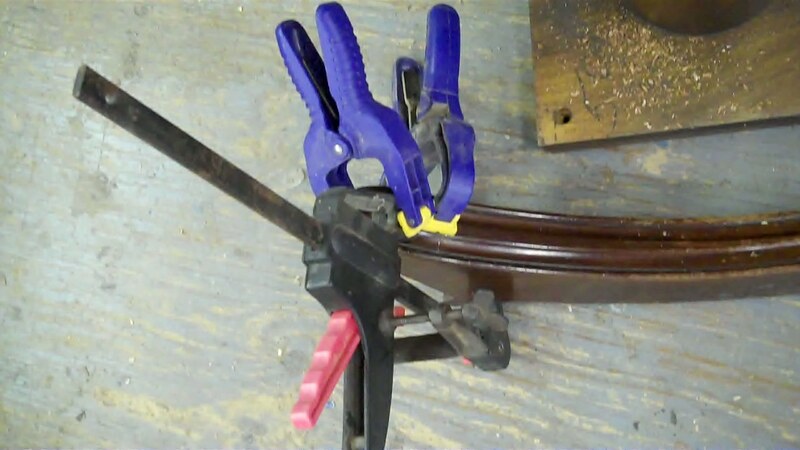 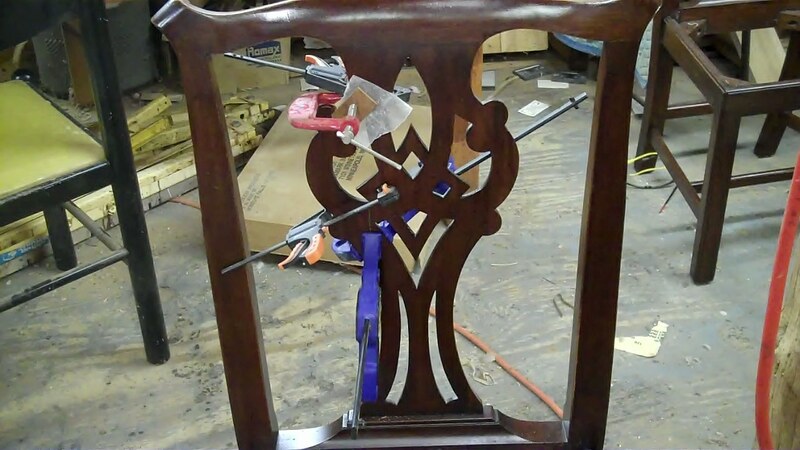 this is a natural weak spot and it must be remembered that Mahogany splits very easily. The first photo shows the break followed by the repair. The last step was to re-attach the legs to the pedestals. 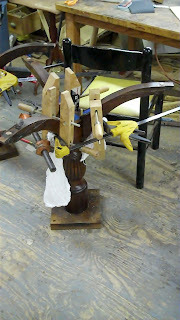 Below is a photo of the bases being glued up. 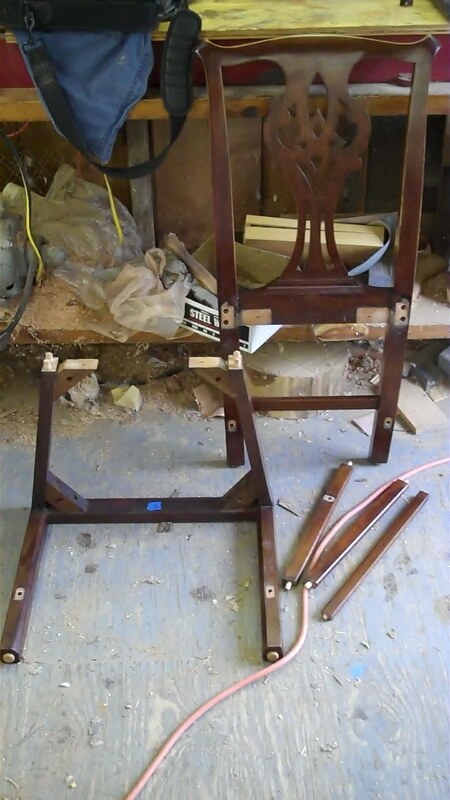 The chairs were loose in different ways, but most had loosened where the side stretchers met the back. 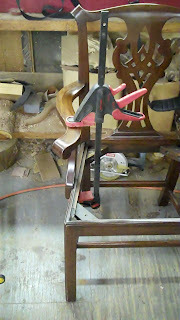 This is a common place for chairs to loosen. 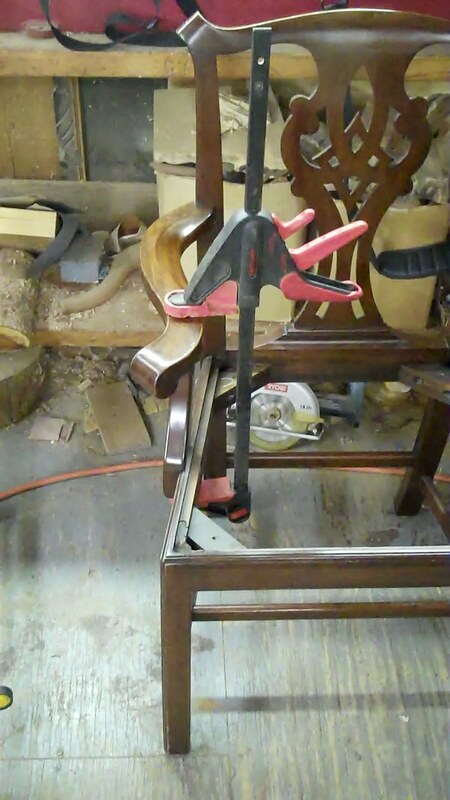 here is a photo of one of the chairs knocked apart followed by several photos of the chairs being glued. This chair had a broken back splat. 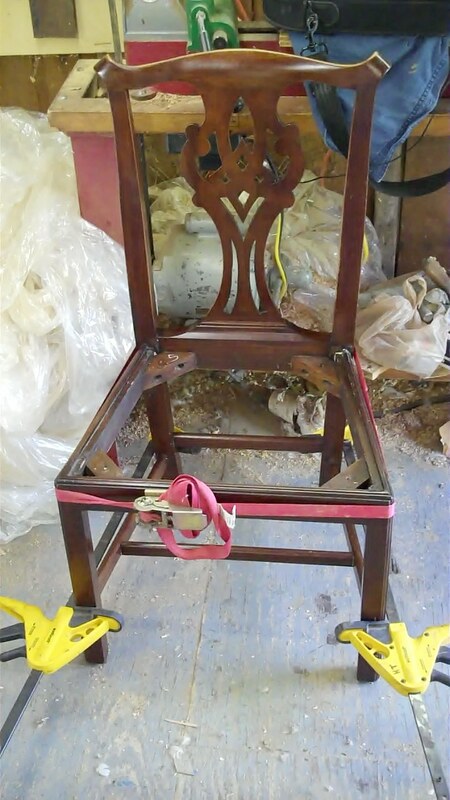 The photo below shows the repair to it. On the arm chairs the arms had loosened, I opened up the joints and re-glued the arms as seen in the photos below. 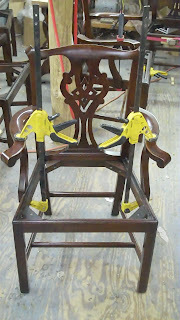 I will post more photos of these chairs later.